Hotel Hassler Roma, owned and managed by Roberto E. Wirth, is one of Italy's most historic and venerated hotels, and is now offering the recipe, courtesy of its panoramic restaurant Im�go, for one of Italian cuisine's most classic dishes: eggplant parmigiana. And while most eggplant parmigiana recipes can become rather time-consuming, Imago's Executive Chef Francesco Apreda offers a quick and easy version that will rival any alternatives. Cut eggplants into slices about 3/4 inch thick. Whisk eggs along with a pinch of salt in one bowl, and place flour in another bowl. Place eggplant slices in the bowl of flour, coating on all sides, and then in the bowl of whisked eggs. Repeat this process once more. Heat peanut oil to medium-high heat and immediately fry eggplant slices until golden brown, turning once. Place the fried eggplant slices on paper towels and sprinkle salt on both sides. Cut each tomato into four slices, taking out the seeds and juice, and then cut the mozzarella into slices. Prepare "sandwiches" using the fried eggplants instead of bread. On each eggplant slice, place a layer of tomato, then a layer of mozzarella, and then some basil leaves, dusting between each layer with grated Parmesan cheese. Place in the oven, pre-heated to 180 degrees, for about 7 to 8 minutes, or until the mozzarella melts slightly. 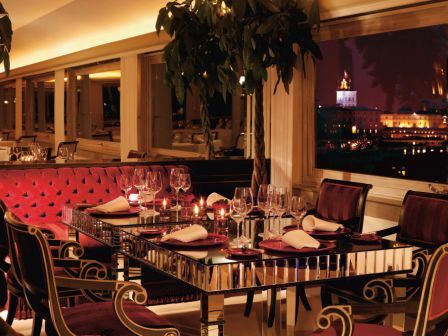 With arguably the best panoramic view of the Eternal City, Hotel Hassler Roma's rooftop restaurant Im�go underwent a multi-million dollar redesign (the first since the original Rooftop Restaurant opened more than 50 years ago) in December 2006, and was awarded its first Michelin star in November 2008. Headed by Chef Francesco Apreda, whose international training includes five years both in Japan and London, Im�go's cuisine is an artful combination of traditional Italian ingredients and flavors with creative and innovative preparations. The d�cor follows suit, blending modern and classic styles with pale grays and deep reds and custom-designed mirror tables that mesh beautifully with traditional touches of white marble flooring and antique-wood inlay. Menus vary according to season, and Chef Apreda's whimsy. Set atop the Spanish Steps and featuring a panoramic view of the entire city, Hotel Hassler Roma, owned and managed by Roberto E. Wirth, has been Rome's five-star lodging of choice for the world's elite for more than a century. Each of the 82 rooms and 13 suites is individually designed and adorned in authentic Italian accents. Highlights include the Michelin-starred panoramic restaurant, Im�go, and the neighboring, Hassler-owned Il Palazzetto (www.ilpalazzettoroma.com), a charming 16-century, five-story palazzo that offers a restaurant and wine bar with panoramic terraces, four rooms, and the International Wine Academy of Roma on the ground floor (www.wineacademyroma.com), with various wine-tasting classes led by world-renowned sommeliers. Over 50 acclaimed chefs and restaurateurs bring diners to the table for "Earth Dinner"
Chefs Collaborative and Organic Valley Family of Farms will commemorate the 40th anniversary of Earth Day with Earth Dinners at restaurants around the country. Developed in 2004, the Earth Dinner provides diners with an opportunity to reconnect with their food, its source, and the memories and traditions associated with it. "We're really pleased to have more than 50 member chefs and restaurateurs participating in this year's dinner series," says Melissa Kogut, Executive Director of Chefs Collaborative. "Earth Dinners highlight the commitment to sourcing ingredients responsibly and talent of our member chefs. The dinners also educate the public about the importance of eating food that is locally grown, in season, and sustainable." 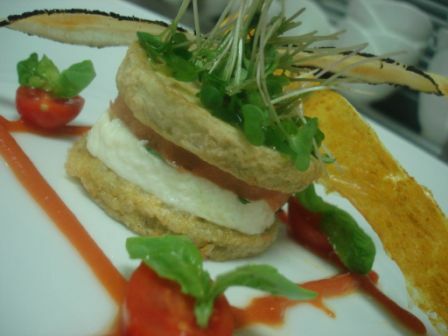 Participating chefs have developed special Earth Dinner menus to be served during the week of April 18-24, 2010. "It's great to be part of a national initiative like this that promotes my philosophy as a chef," says Chef Paul Virant of Vie Restaurant in Chicago, Il. Chef Virant will offer a special Earth Dinner prix-fixe menu featuring regional favorites like local ramps and wood-grilled rainbow trout. Chef Twillia Glover of the Liberty Elm Diner will serve up a "Farm-to-Diner" dinner in a historic, lunch car located in the Elmwood neighborhood of Providence, Rhode Island. "One does not need to dine at a high end restaurant to receive a local, sustainable, and delicious meal," says Chef Glover who also owns her own catering business. The proceeds from the Earth Dinners will support Chefs Collaborative and its continued educational programming for chefs. Restaurant contributions up to a total of $10,000 will be matched by Organic Valley Family of Farms. "We're extremely grateful for the generous participation of our members and the support of Organic Valley," says Kogut. Founded in 1993, Chefs Collaborative is the nation's leading network of chefs fostering a sustainable food system through education and collaboration with the greater food community. For more information, visit the Chefs Collaborative website: www.chefscollaborative.org. Mexican Food: Spicy, No! Rich in Flavor and History, Yes! The history of Mexican food is long and distinct. Since before the 1500s, the making of fine Mexican cuisine has been in the making. The foods of Mexico are known for having rich flavors and brilliant colors, and are made from a variety of ingredients. Yet many people shy away from eating Mexican food because they buy into the myth that it is mainly a spicy cuisine. Mexico is known for. Today, Mexican food still follows many of its original traditions, including the frequent use of corn, beans, avocado, tomato, and tomatillo. Oaxaca has over 50 different spices and chilies ground into a paste with dark cocoa beans to create a delicious semi-sweet sauce for chicken or turkey, which is then lightly sprinkled with toasted sesame seeds. The stuffed Poblano chilies (chiles rellenos) that are lightly coated in egg batter and filled with cheese or meat and deep fried and laden with a tangy tomato and oregano sauce, are a treat that many people love. Serve chilled with slices of avocado and fresh tostadas or corn chips. Marinate the shrimp in lime juice for 2 hours, drain and combine with the rest of ingredients. If you prefer you can poach the shrimp in boiling water, drain, chill and then combine with other ingredients. The menu of Jimmy's is overseen by Executive Chef James Nunn, a former punk rocker, and pays tribute to some of the nation�s favorite regional dishes. Committed to serving locally raised, organic fare, the menu features selections with a lively twist meant to shock and awe the tongue with bold, craveable flavors. Scrumptious dishes include: Southern Cheddar & Pimento Dip with Warm Corn Tortilla Chips; the Short Rib Reuben with Gruyere, Pickled Red Onions and Grilled Caraway Seeded Rye; and Meatloaf with Bacon Rainbow, Mashed Potatoes, Veggies and Herb Gravy. The one and only dessert is Vanilla Bean Ice Cream with Hot Fudge, Warm Chocolate Chip Cookies, Salted Skin on Peanuts and Whipped Cream - and yes, it's big enough to share. On Sundays, Jimmy�s serves a mouth-watering brunch with dishes including the �BUBBA,� with Housemade Buttermilk Biscuit, Fried Chicken, Bacon, Cheddar, Sausage Gravy and Tater Tots; and Cr�me Br�l�e �Pain Perdu� with Bananas Foster Sauce. The bar boasts an inventive selection of hand shaken classic and original cocktails created by Ryan Magarian of Liquid Relations. The beer list offers West Coast microbrews on tap, bottled beers from independent American breweries and some old favorites like Pabst Blue Ribbon―served in a can unless otherwise requested―while the mostly local wine list is served by the glass, carafe and bottle. Inventive house cocktails include the Aperol Smash with Hand Pressed Green Grapes, Fresh Local Peppermint, Vodka, Aperol Italian Bitters and Freshly Squeezed Lemon Juice; the Bees Knees with Plymouth Dry Gin, Freshly Squeezed Lemon Juice, and House Made Clover Honey Syrup; and the Celery Superstar with Hand Pressed Serrano Chili Pepper, Boca Loca Refined Cachaca, Freshly Squeezed Lime Juice, Freshly Extracted Celery Juice and Regan�s No.6 Orange Bitters. Jimmy�s Famous American Tavern is located at 4990 North Harbor Drive and is open Monday � Saturday from 11:30 a.m. to 11 p.m., and Sunday from 10:00 a.m. to 2:00 p.m., then from 4 p.m. to 11 p.m. For more information, please call (619) 226-2103 or visit www.j-fat.com. The sweet, spicy combination of red chili sauce and mango is one of seven flavor pairings America will be layering on this grilling season. The experts at McCormick have lifted the lid on the first-ever Grilling Edition of their signature Flavor Forecast, identifying top sizzling pairings and summer flavor trends. Backyard Bistro - The surging popularity of at-home entertaining continues as grillers recreate the foods and flavors from their favorite eateries. Layer It On! - Grill masters are embracing creativity by merging marinades, rubs, brines, mops, sauces and more. Fired Up Fruit - Grilled fruits are being skewered alongside meats, pureed to make tenderizing marinades, and chopped for salsas and relishes. Ethnic Sizzle - Nearly every cuisine around the globe claims a place on the grill � especially current favorites like Caribbean, Latin, Thai, Vietnamese and Indian. Shaken, Stirred & Grilled - Using flavorful spirits in place of vinegars or other liquids is paving the way for new combinations like mojito marinades and bourbon-spiked pork tenderloin. Cilantro & Lime � Cutting across the diverse cuisines, this bright and zingy pair is a refreshing taste of summertime. Rosemary & Fig � Figs are an unexpected and regionally inspired match for aromatic rosemary. Chipotle & Maple � This culinary comingling delivers an updated take on smoky, spicy and sweet. Brown Sugar & Bourbon � A versatile duo that brings a delicious dose of Southern charm to the patio. Cinnamon & Coffee � Bold and confident � with just the right edge of bitterness. �s famous black mole, the popular pozole, or chiles rellenos. 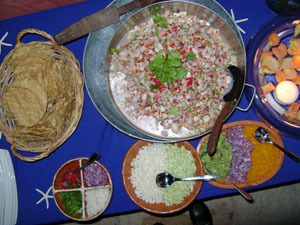 There are also a variety of tasty salsas, used for topping these dishes. Traditional Mexican food was cooked in ceramic pots or cast-iron skillets over an open fire. Much of the food was either steamed or fried, as it is today.